What Is a Sprint on My Treadmill? Will Walking on the Treadmill Help Me Lose Belly Fat? Sprinting is an effective, high-intensity exercise that raises your heart rate and can burn a significant number of calories in a short period of time. Normally, you might sprint outside on a track or running path, but you can also configure your treadmill to incorporate sprinting into a workout at home or at the gym. Everyone’s maximum sprinting speed is slightly different, and it’s important to realize that you may not be able to reach your complete max on a treadmill because of the limited space. However, you can get close. Begin by pushing the button that will increase your running speed and make the treadmill turn faster. Try increasing by 0.5 mph each time. If you can still run comfortably at that speed, turn it up another notch. Your maximum sprinting speed is likely to fall between 8 and 12 mph. Sprinting burns significantly more calories than light jogging. In fact, the faster you run, the more calories you’ll burn, even if you can only keep up the high speed for a short period of time. According to MayoClinic.com, jogging at a speed of 5 mph burns close to 600 calories per hour for a 160-pound person, but running at 8 mph burns nearly 1,000 calories in the same period of time. Even if you can manage only 15- or 30-second sprinting bursts, you’ll burn more total calories during a treadmill workout when you incorporate them than when you jog at a constant speed. Another way to sprint on the treadmill is to vary your speed during a programmed interval workout. You can use a preset option on the machine or plug in your own workout requirements. Usually, an interval workout will begin with a warm-up of brisk walking or light jogging. You move up to a steady jog and then alternate speeds between quick sprinting and moderate jogging for the majority of the workout, which will conclude with a relaxed cool-down. For a challenge, you can pick a program that involves both sprints and inclines. 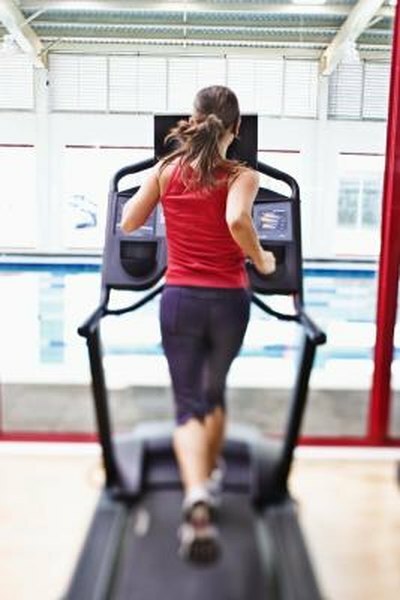 You might get some funny looks at the gym if you try sprinting on a treadmill, because it is possible to fall off the machine if you can’t keep up with its turning speed, or if you let yourself go too far over to one side. For that reason, it’s safest to do your sprints outside, where you have plenty of room. Sprinting is an intense, demanding exercise, and it may not be appropriate for everyone, especially people who have chronic health conditions. If you have any doubt about being able to handle sprint intervals on a treadmill, talk to your doctor before trying them. How Fast Can a Treadmill Go? Are Manual Treadmills Any Good? Does a Treadmill Make Your Thighs Smaller?